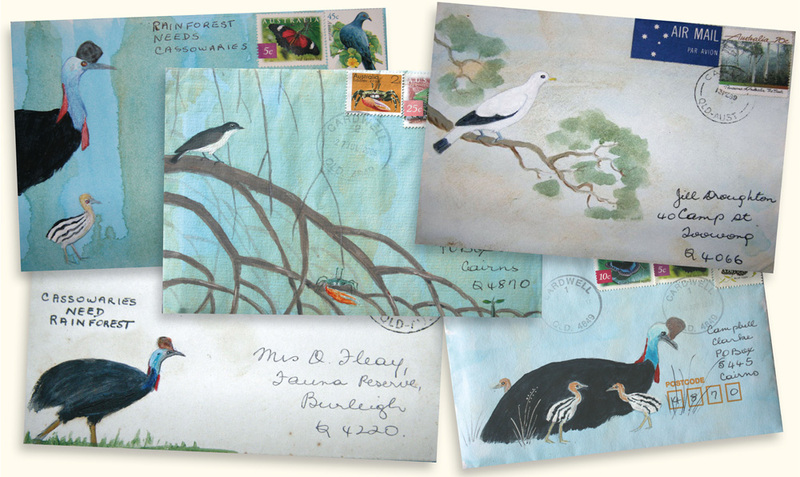 Painted envelopes (Artwork: Margaret Thorsborne). 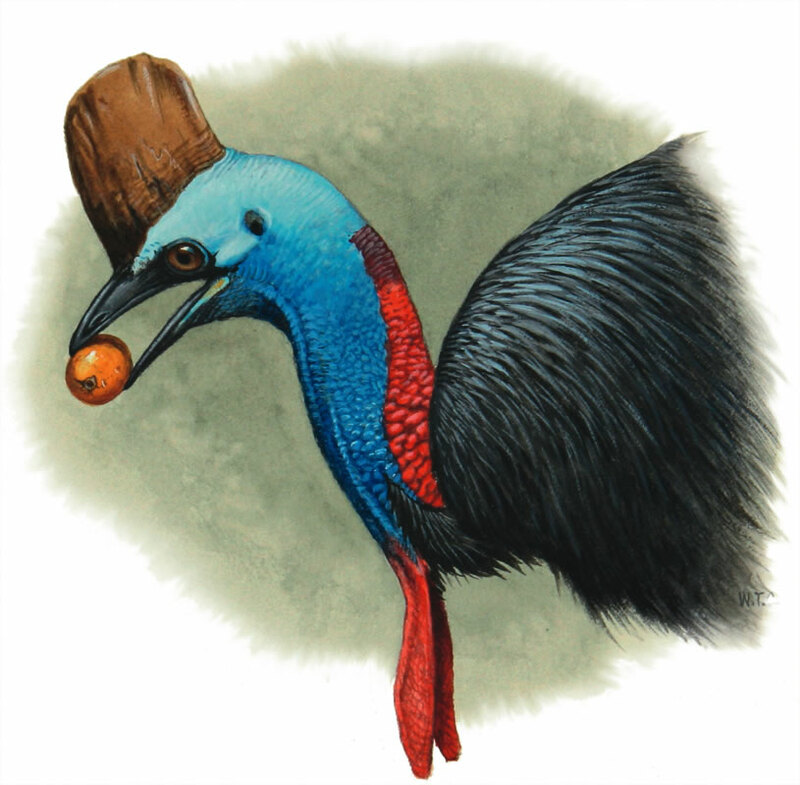 A few days before Christmas 2006 the Queensland Parks and Wildlife Service (QPWS) received reports of a wandering cassowary at Wongabel and on farms outside Malanda. Cyclone Larry had destroyed many of its food plants so it may have walked in search of food from the Hugh Nelson Range near Ravenshoe, the Herberton Range or possibly from remnant habitat in Tarzali or Jaggan. At the junction of the Barron River and Halloran’s Hill Creek near Yungaburra the bird turned along the tributary and became, on Christmas Day 2006, the first cassowary in living memory to be seen close to Atherton. ‘It took a wrong turn,’ suggested QPWS Officer, Peter Latch, for it had to dodge dogs, fences, open farmland and traffic as it crossed a strawberry farm and skirted a kilometre of treeless gully parallel to the Gillies Highway before it found trees on Mountain View Drive. Atherton’s remnant Mabi forest does not provide cassowary food. Halloran’s Hill Creek led the bird to our three hectare native garden on the Gillies Highway and, as there were plenty of ripe native fruits at the time, the cassowary took up temporary residence to our great delight and that of the neighbours, as it became a rare opportunity to study a wild, iconic bird close up. The cassowary was almost fully grown with a red stripe down the back of its neck and a blue one at each side and wattles forming at the front. Males are paler and smaller than females but, without a pair of birds to compare, QPWS rangers assessed it as a sub-adult male looking for territory. For 17 days our garden became its territory, with short incursions into the neighbours’ gardens and, starting at the northern end, it gradually discovered more and more edible fruit trees. It particularly loved Syzygium fibrosum, Syzygium aqueum, Syzygium australis and Eugenia reinwardtiana, but it could reach very few berries and had to check each tree several times a day for windfalls, even risking poking its eyes out as it pecked amongst dianellas for fallen fruit. It was only when the syzygiums became scarcer that it bothered with Ficus racemosa, Ficus nodosa and Ficus superba. During the day the cassowary rested beneath a Syzygium fibrosum tree at our back door. It made a rumbling sound like a suitcase being wheeled over cobbles whenever the washing machine did a spin-dry cycle, or it stretched to full height and saw its reflections in a window, or whenever we came near. Once it chased Tony three times around a tree. Because it made a few other attempts to scare us off our land, Peter Latch gave us an air horn. However, an umbrella proved threatening enough to make it back off. The cassowary survived 17 days in our garden before the Cassowary Response Unit relocated it to an area of continuous habitat on the southeast part of the Tablelands off the Old Cairns Track. Because it was a wild bird and not used to being fed by humans, it took a considerable time to tempt it near enough to drop a huge net over it. Then four rangers, dressed in padded vests, gauntlets and chainsaw chaps, pinned it down while a vet took DNA samples and it was manoeuvred, feet and beak first, into a box and hosed to calm it down. Subsequent DNA testing proved Atherton’s first cassowary was female and that almost all the other lone wandering birds found are also females. The experience showed that even small islands of rainforest trees can be of great value to animals that move long distances. Helen and Tony came to Atherton in the early 1970s so Tony could work at CSIRO. Soon after they purchased 2.86ha of a subdivided dairy farm at Mountain View close to Atherton and spent the first year clearing Timber-Lea of rubbish, old rainwater tanks and car bodies. Over the next three decades they converted a tangle of guinea grass, para grass, glycine and lantana into a garden of lawn and predominently north Queensland native trees. As agile wallabies, water dragons, a lace monitor and birds moved in, they were constantly encouraged. It felt like Paradise Lost when Cyclone Larry worked its destruction but their garden is slowly regaining some of its former beauty. Margaret and her late husband, Arthur, have long been champions of the natural environment in the Wet Tropics, including the campaigns for Cape Tribulation and Oyster Point on Hinchinbrook Channel. They co-wrote ‘Hinchinbrook Island: the land time forgot’ and the Thorsborne Trail is named for Arthur. Margaret and Arthur initiated the annual counts of pied imperial pigeons on the Brook Islands over 40 years ago. For services to conservation, two mosses, a crab, a spider and a vine have been named for them. Margaret lives in a recycled cottage in the wetlands and rainforest near Meunga Creek, handed over as part of Edmund Kennedy National Park. She is a patron of the Wildlife Preservation Society (WPS) of Queensland and has received numerous awards including the ACF Peter Rawlinson Award in 1995, the inaugural Serventy Award of the WPS of Australia in 1998, a Cassowary Award in 1999 and the Queensland Natural History Award in 2006.